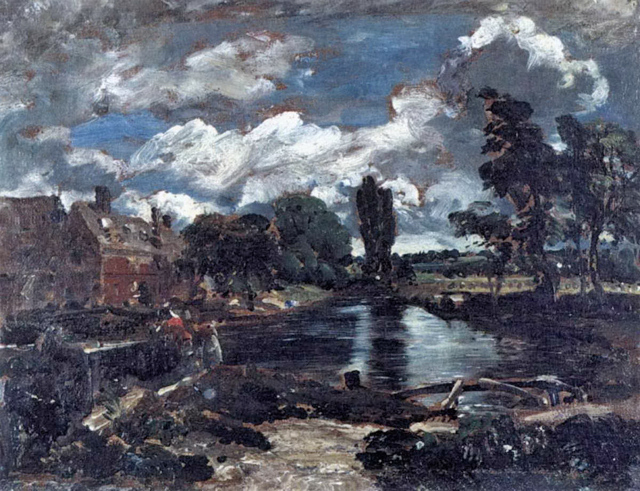 This is an oil sketch 9.75 by 11.75 inches, and later, based on this, Constable produced a finished picture last seen in public in 1926, then it disappeared. It will most likely be in a private collection somewhere, probably in the USA. If you could find the finished version, it would be worth a lot now. Moving around to see more of the mill we can see the views below. You can't see any further down the river due to unmanaged tree growth where the towpath was. As you can see, the main components of this image is still there, the lock design has changed and the whole lot is overgrown, but a small team with a chainsaw could recover this landscape. Getting there: See Flatford Mill, crossing the bridge and turning left you reach this lock and the mill is just beyond.